In the field of Earth observation, present day users and stakeholders impose stringent demands on spaceborne imaging systems, as very high resolution optical, very high resolution SAR imaging. By combining these new constellations with existing systems, overall performance will be significantly improved. Similar formation flying of two observation satellites (optical-optical, SAR-optical, SAR-SAR) were developed recently. For the same purposes in the present project attempt to create the small satellite capable to carry payloads of both categories, optical as well as microwave. The main property of HAMSTER project is the escorting of an existing satellite with SAR imaging capabilities called TerraSAR-X while proving control capabilities in various flight formations using a CCD camera at varying distance between satellites from 500 meters to 10 km. The satellites operational orbit is circular with inclination of 97.8 degrees and height of 514 km. HAMSTER is a very small satellite (Fig.1), composed of “off the shelf” parts only and weights only 75 kg , the estimated cost including the launch is 4.1 M$. Hamster was designed for 6 months duration mission with reliability of 0.94. 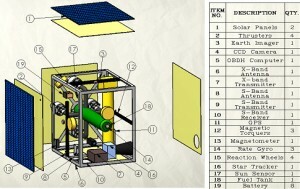 The HAMSTER satellite has two models, but the project focuses on the one which has a payload of a multispectral push broom camera for complementary imaging with the TerraSAR-X imager, this complementary imaging method eliminates the need for a rescanning which appears while imaging SAR only. Earth imaging camera swath is 80 km, resolution is 10m from altitude 514 km. The propulsion system provides total velocity change of 154 m/sec. System is needed for maneuvers to the target orbit, for maintain satellite’s orbit during 6 month, for dispose the satellite at the end of the mission to height of 270km. The propulsion system includes 4 CHT-1 (EADS) thrusters, it total mass is 11 kg from which 6 kg is a mass of propellant. The attitude control system performs high accuracy ±0.5° pointing of the entire satellite during image acquisition, image data downlink. The power system includes solar panels, placed on two sides of satellite’s cubical structure; one set of Sony Li-I battery cells and power distribution unit. In system are used advanced multi-junction panels GaInP2/GaAs/Ge with high efficiency of 23% that supply satellite in orbit with average power about 150W. The simulation of temperature dynamic showed that satellite’s temperature variation range of 19°C- 50°C. The thermal control system keeps each of satellite components in its acceptable bounds, and avoids large temperature gradients in the satellite using only structure conduction and insulation. The communication system consists of S-band and X-band components. Both uplink and downlink of commands and telemetry uses S-band frequency rate 2.3 GHz. The downlink of the stored images operates in X-band frequency rate 8.2 GHz. The system must be able to downlink images at least at 82 Mbps data rate. 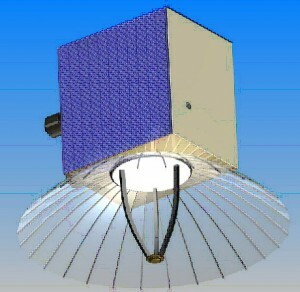 HAMSTER satellite second model (Fig.2) has a SAR antenna receiver payload for a bi – static SAR imaging with TearraSAR-X. The TerraSAR-X transmits a signal and both satellites receive the reflected signal and synchronal analyze the image, this SAR imaging method also reduce the number of rescans of the area. For this model only conceptual design was fulfilled. The feasibility analyzes of passive SAR micro-satellites formation flying with an active Radar satellite is presented. The TOOLSat project was presented on 49thIsrael Annual Conference on Aerospace Sciences, Hotel Dan Panorama, Tel-Aviv, March 4, 2009.